Borderfree Inc (NASDAQ: BRDR) shares climbed 105.30 percent to $13.94. The volume of Borderfree shares traded was 9781 percent higher than normal. Borderfree agreed to be acquired by Pitney Bowes Inc. (NYSE: PBI) for $14.00 per share in cash. Synageva Biopharma Corp (NASDAQ: GEVA) surged 115.89 percent to $206.98. The volume of Synageva Biopharma shares traded 7185 percent higher than normal. Alexion Pharmaceuticals, Inc. (NASDAQ: ALXN) announced its plans to acquire Synageva for $8.4 billion. ClubCorp Holdings Inc (NYSE: MYCC) shares moved up 2.34 percent to $21.41. The volume of ClubCorp traded was 2692 percent higher than normal. ClubCorp priced 12,000,000 shares at $20.75 per share by selling shareholders. 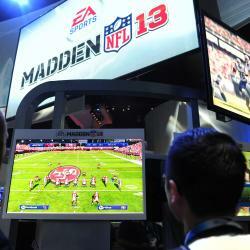 Electronic Arts Inc. (NASDAQ: EA) shares rose 3.45 percent to $61.20. The volume of Electronic Arts shares traded was 489 percent higher than normal. Electronic Arts reported stronger-than-expected fiscal fourth-quarter results.